TOKYO, Japan, September 5, 2013 (ENS) – The Japanese government is preparing to construct a frozen underground wall at the damaged Fukushima Daiichi nuclear power plant as a test to see if it will stop groundwater from flowing into the contaminated facility and keep radioactive water from flowing out. Groundwater is entering the plant’s reactor buildings from the surrounding mountains at a rate of 400 tons a day, adding to the problems of radioactive wastewater on the site. Operated by Tokyo Electric Power Company, TEPCO, the plant lost power to its nuclear fuel cooling system during the March 2011 earthquake and tsunami, leading to fuel meltdowns in three of the six nuclear reactors. The accident is the world’s worst nuclear disaster since Chernobyl in 1986. Prime Minister Shinzo Abe said Tuesday he would mobilize the expertise of all government authorities to play a “proactive role” in managing the disaster. Engineers plan to drive steel pipes 30 meters (98 feet) deep into the soil near the Number 4 reactor building, one of those that experienced a nuclear fuel meltdown. The pipes will be used to surround a 10-by-10-meter (33-by-33 foot) plot on the mountain side of the building. Liquid calcium chloride at minus 40 degrees Celsius (minus 40 degrees F) will be pumped into the pipes to freeze the soil. The feasibility test will start as early as mid-October. If the test ice wall successfully keeps the groundwater contained, the government plans to begin operating the wall by March 2015. Ice walls have been used in the past to block water from flooding tunnels and subways, but building a 1.4-kilometer (0.9-mile) wall around four reactor buildings and their spent fuel pools is new. The government has earmarked 1.3 billion yen, or US$13 million, for the test ice wall and has set aside 32 billion yen, or about US$320 million, to build the entire underground wall. The government plans to spend an additional 15 billion yen (US$150 million) by the end of 2014 on upgraded water treatment units to remove all radioactive elements but tritium, according to energy agency official Tatsuya Shinkawa. 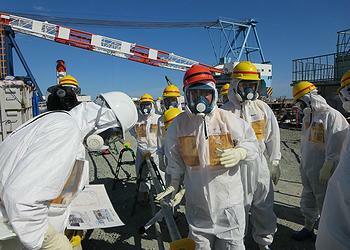 TEPCO has built more than 1,000 tanks holding 335,000 tons of radioactive water at the crippled power plant. Today TEPCO said hundreds of tons of radioactive water that leaked from one of those storage tanks into the ocean last month also may have reached the groundwater beneath the power plant. High levels of radioactive substances, including strontium, were found in water collected Wednesday about 10 meters (33 feet) from the leaking tank at a monitoring well about seven meters (23 feet) deep, where groundwater is flowing. TEPCO also is building an offshore wall of steel panels along the coast to keep radioactive contaminants from spreading further into the sea. The utility says radioactive elements have remained near an embankment close to shore, but experts have reported offshore hot spots of sediments contaminated with high levels of radioactive cesium. Japan’s nuclear regulator Monday said that radioactive water from Fukushima Daiichi eventually must be released into the Pacific Ocean, saying that the plant cannot store huge amounts of coolant water at the site indefinitely, Japanese media reported. “I’m afraid that it is unavoidable to dump or release the water into the sea” after it is purified to levels recognized as safe under international standards, said Shunichi Tanaka, chairman of the newly created Nuclear Regulatory Agency at a news conference Monday. Tanaka’s announcement comes a day after the NRA said that radiation levels of the leaked water at Fukushima Daiichi are 1,800 millisieverts per hour – 18 times higher than previously thought. New measurements of the leakage indicate that the radioactivity levels are lethal after four hours of exposure. 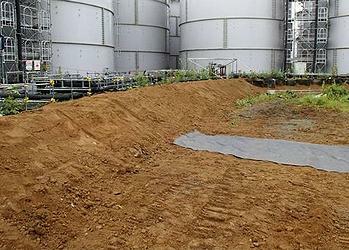 Tanaka also raised concerns that more tanks storing radioactive water at the site are leaking. Still, Tokyo is attempting to reassure the world that Japan is a safe country to host the Summer Olympic Games in 2020. Tokyo hosted the 1964 Summer Olympics and the Winter Olympics in 1972 and 1998. In the bidding for the 2020 Summer Olympics, Tokyo is one of three finalists . Turkey’s bid is shaken by anti-government demonstrations rippling across Istanbul; Spain is struggling with a recession and high unemployment that is affecting Madrid’s bid. The International Olympic Committee will select the 2020 host city on Saturday at their meeting in Buenos Aires, Argentina.